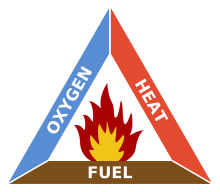 The fire triangle is used to show the rule that a fire needs three things to burn. These things are heat, fuel, and oxygen. If one of these three is removed, the fire will be put out. In the middle of the fire triangle there is also a chemical reaction. Without heat, a fire cannot begin. If fire becomes cool enough, it will not keep burning. Heat can be removed by using water. This only works on some types of fire. Separating burning fuels from each other can also reduce the heat. In forest fires, burning logs are separated and placed into safe areas where there is no other fuel. Turning off the electricity in an electrical fire removes the heat source, but other fuels may have caught fire. They will continue burning until the firefighters deal with them and their fire triangles. Without oxygen, a fire can not start. Oxygen may be removed from a fire by covering it in some way. Some foams and heavy gases (for example, carbon dioxide) are often used for this. The fire can also be closed off away from a source of oxygen. Once all the oxygen in the closed off area is used by the fire, it will go out if it cannot get more oxygen because it needs oxygen. This page was last changed on 21 March 2019, at 17:25.